Become the envy of your neighbourhood with the lovely and appealing Roulette Narcissus Daffodil. 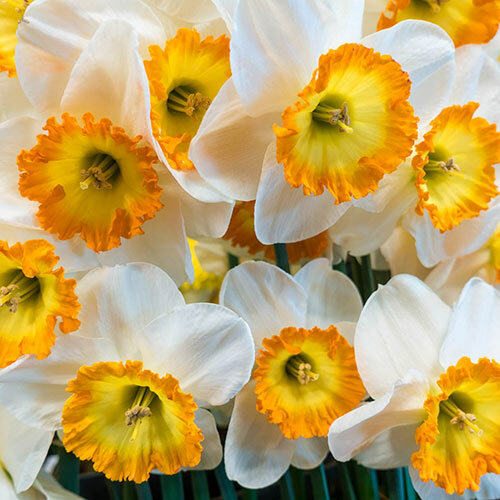 Featuring 4- to 5-inch pinwheel shaped blooms, these sunny daffodils have snowy white petals enhanced by a wide, flat yellow cup rimmed in bright reddish orange. Serving as excellent back borders, these perennials add beautiful splashes of colour throughout your landscape. These narcissus large cupped daffodils flourish in climate hardiness zones 3 to 8. Plant the Dutch-sourced daffodil bulbs in the fall and they will bloom in mid-spring. These daffodils require full sun or half sun and half shade and well-drained soil. They also tolerate clay soil, loamy soil and sandy soil. 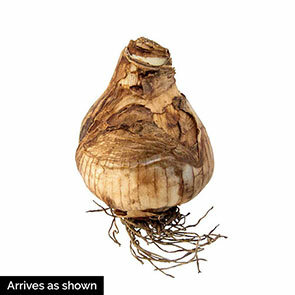 Place the bulbs 6 inches deep and approximately 4 to 6 inches apart. Standing 16 to 18 inches, these beautiful perennials naturalize easily and return in greater numbers every year. Daffodils look right at home scattered underneath deciduous shrubs and trees with other spring flowering bulbs. The showy flowers of the Roulette narcissus daffodil stand out among other daffodil varieties, providing a nice contrast to yellow blooms. Plant your naturalizing Dutch-sourced daffodils on slopes or at the edges of lawns to add some spring colour to your property. Greet spring with a smile when your Roulette daffodils bloom.